Back in 2009 and 2010, Democrats controlled the White House and the U.S. House and U.S. Senate. President Obama, Senate Majority Leader Harry Reid and then House Speaker Nancy Pelosi rammed Obamacare through without a single Republican vote. 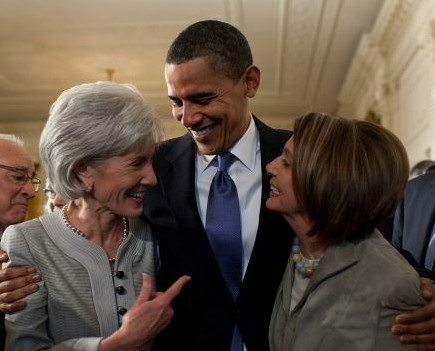 In March 2010, the U.S. House voted 219 to 212 for Obamacare. 34 House Democrats and all of the House Republicans voted against Obamacare. The NO votes were the only bipartisan votes. President Obama signed the Patient Protection and Affordable Care Act (Obamacare) on March 23, 2010. Democrats ignored the plans offered by Republicans at the time – including the House GOP plan drafted by Rep. Tom Price (R-GA) and The Patients’ Choice Act of 2009 introduced by U.S. Senators Tom Coburn, M.D. (R-OK) and Richard Burr (R-NC) and U.S. Representatives Paul Ryan (R-WI) and Devin Nunes (R-CA). Obamacare: who pays for all the free stuff? Five Republican appointees on the court, why is Obamacare’s case even a close call?